The German Chancellor is facing calls from within her own party to step down from the German government and be replaced by CDU leader Annegret Kramp-Karrenbauer two years before she is due to hand over the reigns. 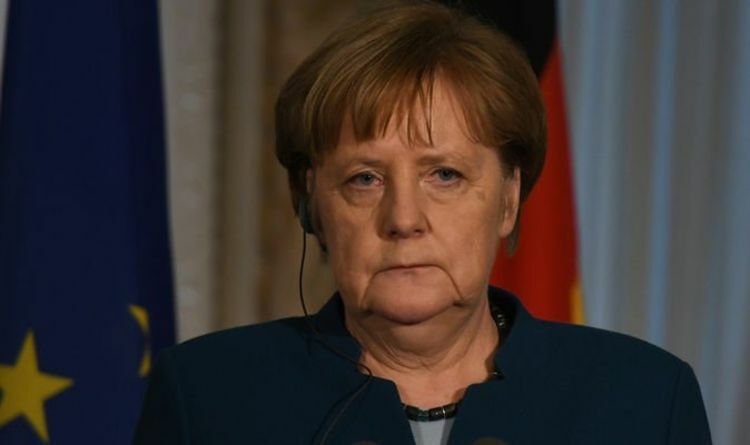 The Conservative value union said Mrs Merkel must step back after the European elections in May, despite plans for her to stand down as Chancellor before the next national election, due in 2021. Speaking to newspapers of the Funke media group Alexander Mitsch, value union chairman, said: “As the Union is even worse off than the already miserable result of the general election. “That's why we need the policy change as soon as possible. "I think it would be best if the process of handing over government responsibility to Ms. Kramp-Karrenbauer and Mr. Merz is launched after the European elections." He said only then could citizens regain confidence in the CDU/CSU ruling government. Mr Mitsch praised Angela Merkel for her achievements as the Chancellor of Germany, but attacked her for standing for a policy without principles and creative will. Mrs Merkel will only participate at the closing rally of the European People’s Party in Munich during the upcoming German European election campaign. The remaining dates will be taken over by Ms Kramp-Karrenbauer. Angela Merkel, 64, announced she was stepping down as CDU party leader and German chancellor in October last year, signalling the end of her 13 career at the helm of Germany. She has been CDU chairwoman since 2000 and giving up the role will start a race within the party to succeed her as chancellor. Mrs Merkel has been at the helm of Germany for 13 years after becoming the German chancellor in 2005. She has loomed large on the European stage since 2005, helping guide the EU through the euro zone crisis and opening Germany's doors to migrants fleeing war in the Middle East in 2015 - a move that still divides the bloc and Germany. But the German leader has faced a testing few years due to major challenges at home and abroad - ranging from overcoming the refugee crisis, a digital deficit and pushing the German car industry toward cleaner mobility to seeing through eurozone reforms and managing Brexit.